She noted that security and defence cooperation were key steps in addressing Boko Haram and Islamic State in West Africa. Nigeria and Britain have stepped up the war against insurgency and sundry vices with the signing of two agreements – Defence and Security Partnership and Economic Development Forum. With the pacts signed by British Prime Minister, Theresa May and President Muhammadu Buhari, yesterday, at the Presidential Villa Abuja, both countries resolved to jointly work to tackle the menace of Boko Haram, human trafficking and corruption. May who said following the exit of the UK from the European Union, there was need to seek more economic ties with Nigeria, pledged that the United Kingdom would assist the country in the fight against terrorists as well as human trafficking. Speaking in Abuja, May told Buhari: “I’m delighted to be able to be here in Abuja and to continue the very good discussions we had when you were in London in April. …we already have very good cooperation between the UK and Nigeria which include education, defence, security and trade relations. “We are ready to cooperate together on global and regional issues; to strengthen that cooperation and partnership, I have with me a business delegation, as we look to enhance our ties in future and explore more trading opportunities. “We will also be looking to work together to step up efforts against security threats from Boko Haram, human trafficking and the likes. And of course, also cooperate to fight corruption and lifting people out of poverty,” she said. May appealed to Buhari to use his position as chairman of Economic Community of West Africa States (ECOWAS) to keep the issue of human trafficking on the front burner in the sub-region. She welcomed assurance by the Federal Government on credible elections in 2019. 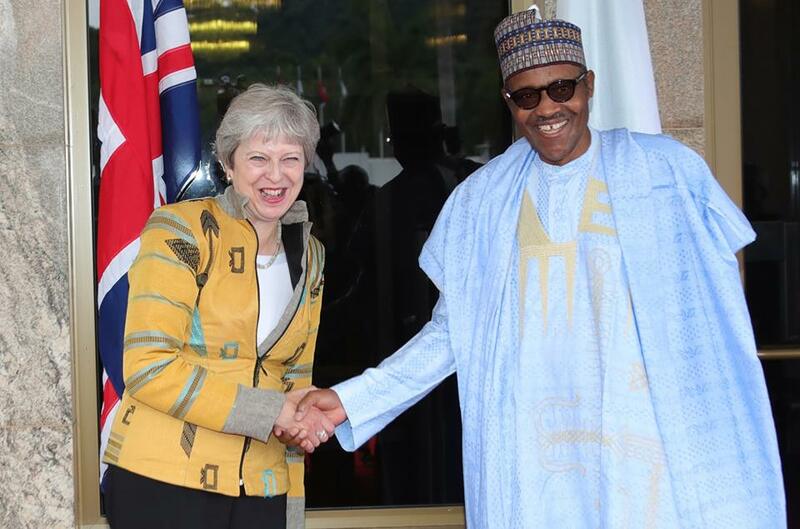 While welcoming May who has since left for Kenya in continuation of her tour of African countries, Buhari appreciated the support Nigeria was receiving from the UK in the fight against terrorists even as he gave commitment to conduct free, fair and credible elections in 2019. ‘‘I assure you that I’m all out for free, fair and credible elections. I’m very pleased that my party is doing very well. The High Commissioner will brief you more. The recent successes in polls in Katsina, Bauchi, and Kogi have boosted our morale greatly. “Nigeria has accepted multiparty democracy and that is putting politicians on their toes, forcing them to work harder,” he said. A statement by the Special Adviser to the President on Media and Publicity, Femi Adesina, said Buhari applauded UK’s support to the country on the anti-corruption campaign. Shedding light on the two pacts, Minister of Foreign Affairs, Geoffrey Onyeama, said it highlighted the two priority areas in the relationship between both countries. “Under the Defence and Security Pact, it is a comprehensive agreement that covers all aspects of security challenges. So, apart from the military training, there is also the support for policing, civil policing, human rights aspect of security and the close cooperation that the two countries will have, the training that will be provided by the UK to our security forces. “On the economic development forum, this is a forum that really aims at co-prosperity. The prosperity of our two countries are sloping to leverage in areas where we have as countries comparative advantages, the financial centre that London is and the investment opportunities in our country and ready to build that up with the private sector as well as the government level. So everything will be comprehensive and involve different stakeholders and this is in the context of UK’s BREXIT. Coming out of the European union, they feel freer now to engage with countries on bilateral level and build up trade relations with those countries. put forward a roadmap that is really transforming this country. So this partnership is a framework that is very key to our Economic Growth and Development Plan.